Justice League Doom is the finest DC Animated movie since Justice League: The New Frontier. An all-star modern day Superfriends geekout, Doom features the world's greatest superheroes, Superman (Tim Daly), Batman (Kevin Conroy), Wonder Woman (Susan Eisenberg), The Flash (Michael Rosenbaum), Green Lantern (Nathan Fillion), Martian Manhunter (Carl Lumbly), and Cyborg (Bumper Robinson) banded together to take on their arch nemeses, Metallo "The Man With The Kryptonite Heart!" (Paul Blackthorne), Bane (Carlos Alazraqui), The Cheetah (Claudia Black), Mirror Master (Alexis Denisof), Star Sapphire (whose revealing costume pushes the boundries of Doom's PG-13 rating, voiced by Olivia D'Abo), and evil Martian Ma'alefa'ak (Carl Lumbly), assembled as The Legion of Doom. Each hero and villain is voiced with gusto, making the most of some hokey, melodramatic comic booky dialogue. This new Legion of Doom is lead by the immortal despot Vandal Savage (Phil Morris), who also hired along the Royal Flush Gang. Plus a slew of fan favorite supporting cast members like Lois Lane, Jimmy Olsen, and Batman's venerable scene-stealing butler Alfred make appearances. 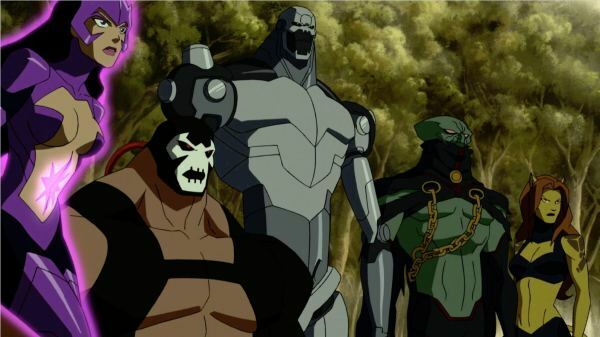 Loosely adapted by the late Dwayne McDuffie from Mark Waid's "Towel of Babel" comic book story, Justice League Doom revolves around the Legion of Doom stealing Batman's secret protocols regarding how to combat and contain his fellow Leaguers should they turn evil. Batman plotted some "brilliant" (says the movie) scenarios, such as tricking Superman into foiling a suicide attempt so that he can be shot with a Kryptonite bullet, forcing a delusional Wonder Woman to fight until her heart explodes, or immolating Martian Manhunter. Batman claimed his protocols were merely for containment and were not designed to be lethal. I don't know, Bats, shooting Superman in the chest with Kryptonite or inducing Wonder Woman to have a heart attack sound pretty lethal to me. Plus for a guy who hates guns because of, you know, mommy and daddy KABLAMMO, weird that Batman's plan to stop Superman revolves around a gunshot. Batman really dropped the ball with his strategy for Green Lantern: make him think he got some innocent people killed (including a lookalike of his girlfriend Carol Ferris) so he quits wearing the ring and sobs in a cave like a buffoon. (And the woman was an android, Batman hilariously reveals! Hal Jordan was blubbering over an android and cradling it in his arms unwittingly.) Seems to me, Batman got the idea by reading "The Cosmic Odyssey" where Green Lantern John Stewart's blunder destroyed a whole planet and he couldn't deal with it. Batman himself finds the grave of his beloved parents exhumed and he gets beaten and buried alive by Bane. It took Batman forever to attack Bane's glaringly obvious weakness and cut the tube that supplies him with his super steroid juice. Chris O'Donnell's Robin and Alicia Silverstone's Batgirl figured it out in seconds in Batman and Robin. The Legion of Doom has bigger fish to fry than just taking out the Justice League. Vandal Savage, who has been alive for over 50,000 years would like to see half of the planet's population wiped out so he can rule the other half. To wit, his nefarious plan is to launch a missile into the sun to ignite a solar flare that would roast half the Earth in eight minutes. Can the League overcome the calamities one of their own masterminded against them and rally in time to stop the forces of evil and save the Earth? Of course they can, by the wackiest ways possible: Superman chases the missile into the sun itself, Green Lantern uses his Power Ring to block the solar flare, and the rest of the League use the technology of the Legion of Doom's headquarters (which Cyborg took it upon himself to coin "The Hall of Doom") to render the Earth and everyone on it intangible so that the solar flare passes straight through the planet, no harm, no foul. Superman: "Maybe I could move the Earth out of the way!" Batman: "If we had a week, I couldn't list all the reasons why that won't work." Well, if the League F-ed up, Superman can always fly around the Earth and turn back time. That plan hasn't failed yet.